In this thread I'll be reviewing Marvel's Silver Age in chronological order starting with Fantastic Four #1. I'd like to start off by thanking Slam for being gracious and not minding me covering the same ground as his recent thread. 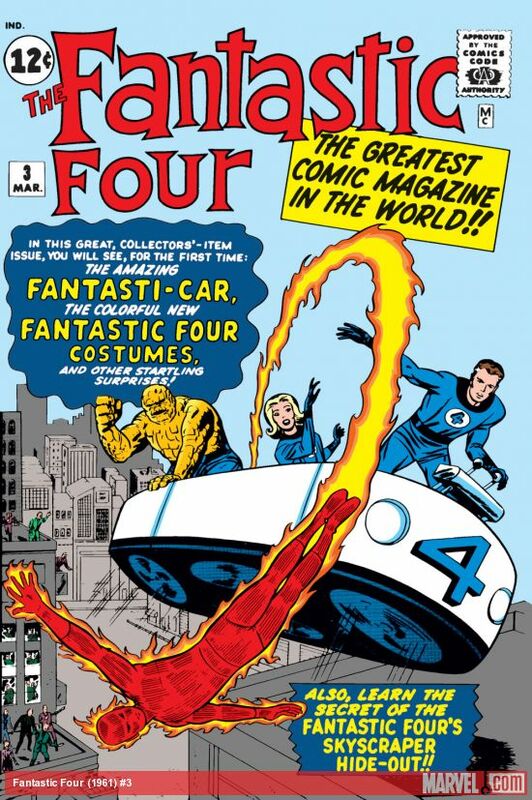 My stopping point will be Jack Kirby's last issue of Fantastic Four (#102). I think many would agree that, coupled with the fact that he finished his Thor run a month prior and penciled the last issue of the Silver Surfer's first series that same month, this is clearly the end of Marvel's Silver Age. I mulled over the idea of going as far as Stan Lee's last issue of Amazing Spider-Man, but by that time Stan had already handed over most of the writing chores to the first crop of now legendary Bronze Age writers. Another clear sign for me is that a month after Kirby's last issue of FF, we see the release of Conan the Barbarian #1. This easily gets my vote for the comic that ushered in the Bronze Age. At the very least at Marvel. I'm in this for the long haul and will be getting the bulk of my reading and reviews done on Friday and Saturday. I'll be reviewing all the super-hero titles plus Sgt. Fury, for obvious reasons. 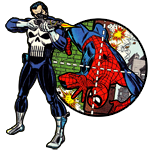 As of right now, and to my great annoyance, Marvel Unlimited (my main resource) has incomplete runs of Marvel Super-Heroes, Sub-Mariner, Captain Marvel and Nick Fury: Agent of SHIELD. These are the only titles that I don't have full access to, but seeing as though they all start very late in the Silver Age, I might be able to pick up some cheap Essentials or some other trade in the interim. Marvel Unlimited will be my primary source, but I'll be using my various Marvel Masterworks, Epic Collections and DVD Roms to fill in any gaps in the other series that I run across. Synopsis: A short synopsis of each issue. Ill try to keep this short, but concise, particularly for those issues most of us know by heart at this point. First Appearances: A short run-down of characters appearing for the first time. Comments: This will be my section to spew various opinions and share feelings on each issue. I do tend to lean a bit toward comedy and satire at times, particularly with some of those goofier early issues, but I'll try to keep this to a minimum. Promise. Characters Development: I thought it would be interesting to keep track of how the various characters develop throughout the Silver Age. I'll only comment on characterizations that are clearly evolving as they become apparent. It would be redundant to comment on how Reed Richards or Hank Pym were still acting the same issue after issue. This will, of course, apply to all major characters in each series, including villains and supporting characters. Personal Rating/Historical Importance: As has become the standard, I'll give my own personal rating and the issues historical importance. To keep it dirt simple, I'll be using a system of 1-10 with brief explanations. 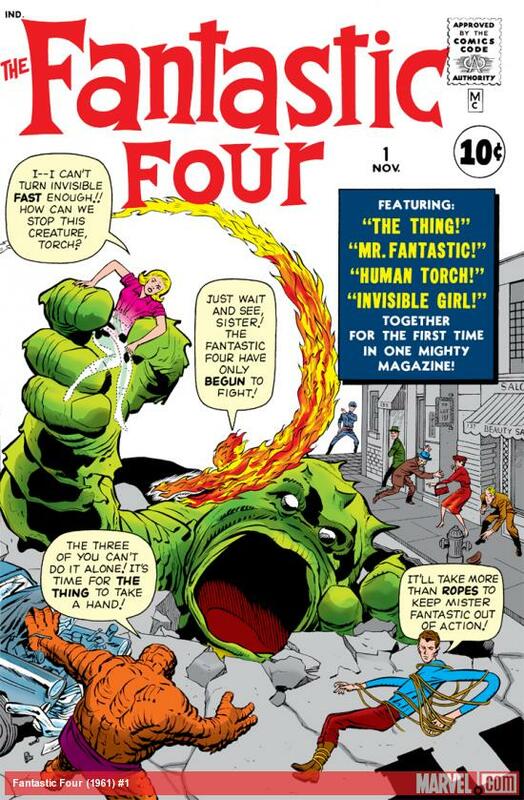 Synopsis: The Fantastic Four come together for the first time, ushering in the Marvel Age of Comics. After Reed Richards uses the FF's signal flare to call a brief meeting, a recounting is told of how our heroes gained their powers after flying an experimental rocketship through space that was bombarded with cosmic rays. Richards then explains that atomic plants are being destroyed around the globe, leaving enormous holes in the ground. Using his high-tech equipment to pinpoint the origin of the disturbances, the FF travel to the fabled Monster Isle. After battling several monstrous creatures, the FF discover that it is the Mole Man who is controlling the creatures behind the destruction. After a brief battle with the Mole Man and his most powerful monster, the FF manage to seal the Mole Man and his creatures beneath Monster Isle. As the FF fly away in triumph, the Mole Man seemingly destroys the island in a massive explosion. Comments: I'm not sure that I can say anything about the first issue of the Marvel Age that hasn't already been said. As has been pointed out by others, the issue does give the distinct impression that it was cobbled together from other sources. At its most basic, it's an amalgamation of The Challengers of the Unknown (an earlier Kirby creation for DC) and the monster comics from the Atlas era. Still, the now trademark bickering, primarily seen in the tension between the Thing and Mr. Fantastic, was revolutionary for early 60's superhero comics. The scenes where the FF first display their powers are all amusing and sorta goofy, but I still can't help but feel that they work. That said, do we really buy that the only thing the hormone driven Johnny Storm likes more than cars is answering the FF single flair? I'd also like to know why the Thing felt the need to wear his fedora and trenchcoat disguise on Monster Isle while the rest of the team was in exploration gear. I do get a kick out of the Thing dramatically flinging them off during his first encounter with the Mole Man every time. Characters Development: Since this is the first appearance of the FF as characters, there can't be any real "character development", but I think I can say a few things here given the peculiarities of the issue. It's interesting that the Thing starts off as a cloth-shopping stoic, but ends the issue closer to the Thing we'll soon grow to love. He even seems to switch to using contractions in the second half of the issue! The much noted love triangle between Sue, Reed and Ben is apparent, but since this will soon be forgotten, it's little more than a dead end. I think it was wise for Stan and Jack to drop this concept and move it over to the soon to be re-introduced Namor. Personal Rating/Historical Importance: 5/10. This is clearly one of the weakest issues of the FF taken from a pure story perspective, but given the historical context, that's easily forgiven. I just can't drop it lower than a five. Historically, well, it's right up there with Action Comics #1 and Detective Comics #27. It's just that important. In the context of the evolution of story and characterization in the superhero genre, it might very well be the most significant issue ever published. I love that the cover blurb advertises having the four characters together for the first time, conveniently ignoring that they've never appeared separately either. He did it to himself. He wanted to lasso the monster but being how he had just acquired his stretching powers, he couldn't control his muscles and body functions correctly. The real question was, why bring a small rope to a giant monster fight? And what could Sue Storm hope to achieve as well? Reed is wearing cowboy boots, maybe he was at a rodeo when the monster attacked, and was startled and accidently hog tied himself. I like the idea that the monster's first action, at least on the cover scene, was to attempt to tie Reed up with a tiny rope. Then he think's, "Argh! I no good at this! Need more practice! Finger's too fat!" then proceeds to rampage. I'm sure I'll improve as I go along with these reviews. I really should have commented on the art and writing more specifically. I'll correct this in future installments! I just woke up (I'm off the next two nights but try to stay on my night schedule if at all possible.) and I'm now downing some of my Dunkin Donuts coffee. I plan on getting several more reviews in tonight and in the early morning. Synopsis: The Fantastic Four become public enemy No.1 after they seemingly begin committing acts of theft and destruction. Unbeknownst to the public, the real Fantastic Four are hold up in a cabin and soon hear the news. Reed instantly realizes that someone is impersonating them to discret their good name, but before he can formulate a plan of action, the group is surrounded by the military and taken to a special facility designed to hold them by nullifying their powers. The FF easily escape and start to formulate a plan. Johnny has the idea to pretend to attack an experimental missile test, in the hopes of drawing out the villains. This succeeds and the Torch is taken back to the fake FF's hideout, where he discovers that they are really Skrulls; shape-changing aliens who used a combination of their own powers and various devices to simulate the FF's powers. The FF show up on the scene and rescue the Torch, and after defeating the four Skrulls, they convince their leaders (orbiting in a city-sized spacecraft above Earth's atmosphere) that Earth's defenses are just too strong to risk an invasion. This trick works, and after the Skrulls depart, Reed clears the FF's name to the authorities by exposing the captured Skrulls. Reed then hypnotizes the three remaining Skrulls and has them change into milk cows, seemingly to live out the remainder of their lives in blissful peace. Comments: It's clear that at this admittedly early point, Stan and Jack haven't fully grasped what they had with these characters. While it's not a bad plot in and of itself, it's filled with some high level wackiness that would put most DC comics of this era to shame. The most infamous, and to me most hilarious, is the scene where Reed fools the Skrull captain by displaying clippings from Strange Tales and Journey Into Mystery as actual Earth defenses. Now, it would be a stretch to buy an advanced race being fooled by the best special effects from live action movies, but being fooled by pencil and ink drawings put down on newsprint? I can only imagine how this derailed the career of the Skrull captain once all the facts were brought to the table during his annual military peer review. As far as the creators go, Lee hasn't found his voice yet and there is little of his trademark humor. I chalk this up to my earlier opinion that they were still bouncing things off the wall, still somewhat stuck in the Atlas era, and not yet emboldened with the knowledge that the FF were a hit. Kirby's art is fairly standard for this period. I think Klein's inking style had a lot to do with the tame look of Kirby's art in the first two issues. Besides the impressive opening splash page featuring the fake Thing swimming menacingly to the doomed oil rig, we're still a few years away from Kirby's artistic peak. Characters Development: While the quartet are little changed from the first issue, they do display an impressive level of resourcefulness and smarts in so easily escaping from the military holding facility. It's made clear that while Reed is the clear leader and genius of the group, the other three are far from average in the intellect department. The Thing is particularly moody in this issue and even comments that he'd probably be better off dead! This is fairly dark stuff for the early Silver Age. We also get the first glimpse of one of Ben's many bittersweet temporary changes back into his human form. Luckily the Thing will start evolving from this point in the next issue and we'll start to see more humor and likability in his characterization. Personal Rating/Historical Importance: 5/8. As a story, this issue is nothing to write home about and doesn't give us much of a glimpse at the grandeur yet to come. The plot is fairly interesting, but the silliness and rushed feeling to the second half of the story are major flaws. Historically, the introduction of the Skrulls is very significant to the development of the Marvel Universe, particularly the cosmic landscape that would develop throughout the 60's and into the 70's. 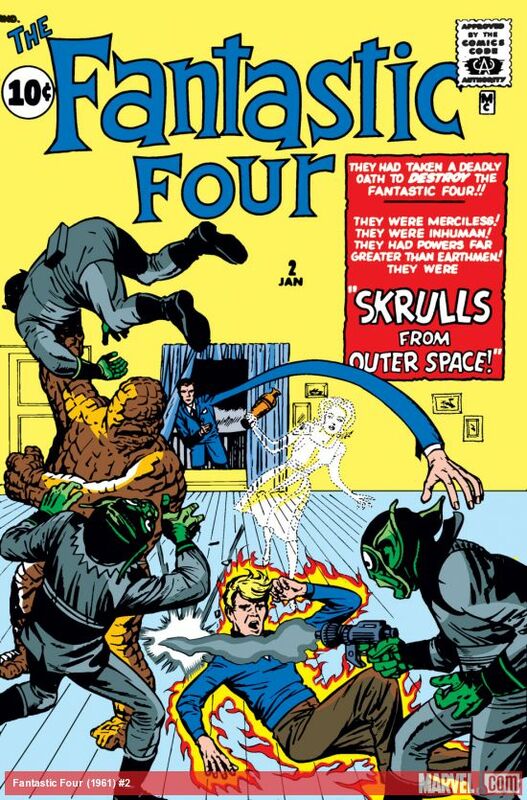 On first glance the Skulls seem like generic "little green men" brought in to be the one-off villains of the month, but as we'll see in upcoming issues of the FF, it wasn't lost on Stan and Jack that there was enough raw material there to build on. And build they shall. I always love looking at the early stuff, and seeing how much the visual look of the characters evolved over time. Also, Sue fighting an alien invasion in a sun dress is pretty awesome! I see this scene - using comic stories as a way to advertise other Marvel Comics - as the first step towards continuity. As I may have pointed out in my last 17,456,001 posts, selling product has always trumped any high falutin' notions of "art" or "logic" in mainstream comics, and this scene shows definitely foreshadows Silver Age Marvel's particular brand of let's-have-Daredevil-in-the-Fantastic-Four-in-order-to-get-the-kids-to-buy-Daredevil brand hucksterism. Glorious! Synopsis: Brilliant scientist Henry Pym discovers a shrinking and growth serum that allows him to shrink objects and then restore them to their normal size. After conducting several tests on various objects, Pym decides that the final test is to test the serum on a living person…himself. After the serum shrink’s Pym down too small, too fast, he realizes that he now can’t reach his growth serum. He finds himself outdoors and is then chased by a group of ants into a nearby ant hill. After falling in honey, he is save by a lone altruistic ant, and after several daring escapes, he succeeds in gaining access to his growth serum with the help of that same friendly ant. Pym decides to pour his serum down the drain and then decides to only focus his scientific efforts on practical projects from here on out. 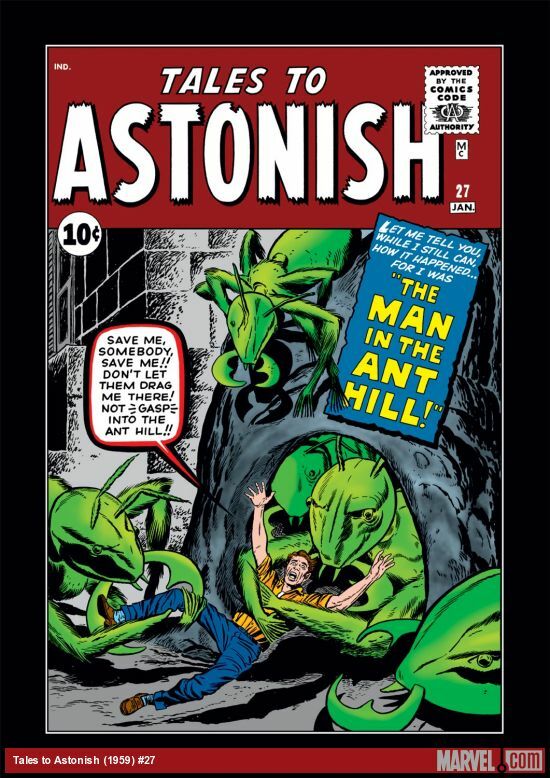 Comments: This little story was obviously intended to be a standard Tales to Astonish one-and-done, but it’s easy to see why Stan and Jack might have reconsidered the character of Hank Pym and then decided to retrofit him into a Ray Palmer/Atom analog. The story itself is silly, making Pym seem like an idiot for not thinking through all the steps he would need to take to safely shrink himself down to size. “Ooops! I left the growth serum on the window ledge! I guess the only thing to do is to hop frantically outdoors so I can fight for my life against carnivorous insects!” It’s an interesting twist that one lone ant, for some inexplicable reason, decides not only not to eat him, but to save him (Twice!! ), but in the context of the story as a one-off it’s hilariously ridiculous and nonsensical. Also, where did Pym get that tiny rope? The art by Kirby and Ayers is solid, but unspectacular, and Lieber's writing is fairly standard for a TTA one-off. Thing's pick up on all creative fronts when next we meet Pym in TTA #35. Characters Development: None since it’s Pym’s first appearance. Since he wasn’t originally created to be a superhero, he does come off as impulsive, a bit paranoid of his scientific colleges and not particularly heroic. He does show his action hero potential by striking a match with a tiny people and materializing that tiny rope, though! Personal Rating/Historical Importance: 4/8. As a story, it’s decidedly below average, with its obvious importance lying solely in it being the first appearance of Henry Pym -- who would go on to be one of the most important characters in the Avengers for years to come and one of Marvel Earth’s most influential scientific minds. I agree. It was brilliant marketing when they really had few advertizing outlets for the comics themselves: no internet, reviews, etc. The icing on the cake for me was that the Skrull captain just happened to be carrying the Skrulls highest award for honor on his person. At least he had high hopes for the mission. Synopsis: The FF are attending a performance of a stage magician known as the Miracle Man when he calls them out in the audience, derides their abilities and invites the Thing on stage to test his powers. After seemingly proving that his power is much greater than the FF’s, the group makes their way back home, by Fantasticar, to their Baxter Building headquarters. After Sue presents her teammates with the their new Fantastic Four uniforms, Johnny notices that the Miracle Man is in the crowd of a big movie premiere that’s being televised. Suddenly, the large promotional monster seemingly comes to life, and after going on a mini rampage, vanishes. The FF deduce that the Miracle Man is responsible and soon after are tasked by the police commissioner to take him down. After Reed, Johnny and Ben fail to capture the villain and prevent him from stealing an atomic tank, Sue turns invisible and hides in the back of his getaway truck. While the Miracle Man attempts to hide the atomic tank in a junkyard, his guard dog discovers Sue’s presence. He hypnotizes her into signaling for the rest of the FF, they arrive, and thanks to a bright burst of flame from the Torch, they manage to subdue him after he attempts to escape in the tank. Reed then explains that the Miracle Man is really just a master at mass hypnotism and that he has no real superpowers. The Torch is angered at the Thing’s stubborn refusal to give him credit for stopping the Miracle Man and fly’s off, claiming that he’s quitting the group. Comments: This has always felt like the REAL fist issues of the Fantastic Four to me. The three major additions to the ever expanding FF universe are the costumes, the Fantasticar, and of course the now fabled Baxter Building. The cutaway view of the interior of the Baxter Building is a real treat and the highlight of the issue. It would be done many times in the future and never fails to give me a true appreciation for Lee and Kirby’s world-building prowess. (Of note is that Lee and Kirby still haven't revealed that the FF are actually based in New York City. That’s revealed next issue. That said, they seem to have already decided to drop Central City as a setting as it isn't mentioned again.) There are still of course several goofy/funny moments that stick out to me, particularly Sue’s rather insensitive presentation of a face obscuring helmet to Ben, Reed’s exploits as a makeshift tire and of course the completely nonsensical hypnosis-based abilities of the Miracle Man. As far as the art and story goes, I feel that this is the strongest issue on both fronts from Lee and Kirby. In particular I like the splash of Sue and Ben flying in on the Fantasticar's and the amusing chase scene toward the end. There is still much improvement to come, but it’s nonetheless clear that they knew they had a winner on their hands. Characters Development: This issue is also noteworthy for the fact that it’s our first real glimpse into the group dynamic of the FF that will become more sophisticated as the series progresses; we get a peek at Sue’s motherly nature and sense of style, Johnny’s wise-cracking sense of humor and the Things good-natured irritability at just about everything. Ben comments that he wishes Sue would look at him like she does Reed, but this is the last time we see a clear indication of a love-triangle in the FF, particular after the events of the next issue come to pass. Ben’s comment leads to his first major spat with Johnny, which boils over to the point where Johnny’s so upset he cuts out on his teammates. This is the start of a long-standing friendly rivalry between the two that deepens over time. Personal Rating/Historical Importance: 6/9. This issue, for all its flaws, is an above average issue of the FF and better than the first two issues; mainly because of the historically significant additions to the series. The additions of the uniforms, the vehicles and the Baxter Building elevate its importance far beyond what it would have been otherwise since it clearly shows that the FF are now full-fledged superheroes with established roots. I felt that way about X-Men, too.. the first couple issues were really just Stan working things out in front of the world while he settled on what he wanted. It's funny, you'd think in today's world of instant feedback and creators talking with fans online that'd happen more today, but it's just the opposite.